Creating something beautiful: Turn your photos into a gorgeous digital scrapbook! Hooray! Now that the hard part is over (cleaning up your photos), the REAL fun can begin. With all your photos now neatly organised (phew! ), you can leave the mess of traditional scrapbooking behind. It’s time to get inspired and design something beautiful to show off all those precious moments! Perfect on a coffee table or spread on a shelf in your home, creating a photo book can be a great way to start decluttering and to show off those wonderful moments too! You have complete freedom to personalise your photo book in a way that best represents you. With the many features on our photo creator tool, your choices are endless. So put on your creative thinking cap and design your very own stunning photo book in 3 easy steps. All you have to do is ‘Choose’ your size and style, ‘Create’ and personalise your photo book and ‘Click’ Order! It’s that easy. If you’re still not sure about what suits you, you can also choose from more than 10 different pre-designed themes to suit your style. It’s the fast and easy option but don’t worry, you can still add in personal touches to make it your own. Our auto fill feature can help make life easier. All you need to remember is to consolidate the photos you want included into one folder on your computer and the auto fill will (obviously!) fill it up for you. And of course, you would still be able to adjust the images according to your liking. Too excited and can’t wait to show off that gorgeous photo book you just ordered? After placing your order, you’ll also receive a free online version of your book so you can share it with your loved ones on Facebook, Twitter or e-mail. 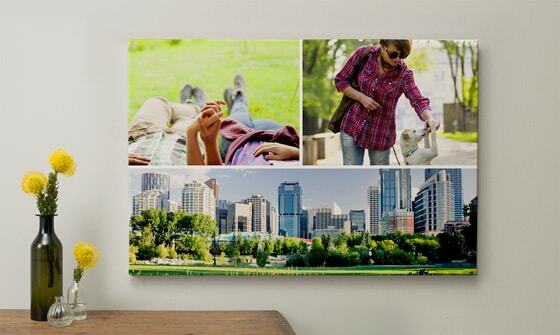 Brighten up your living room OR dress up the outside garden or balcony with our decorative wall art! Too many pics to choose from and can’t decide which is your favourite? Try the collage feature to tell a story using different photos from the same time period, event, holiday, etc. Another great idea is to create multiple collages with the same theme to hang together on your walls. And we mean off your desktop and on to your mobile! Sorting through all your pictures, you’re bound to come across a cherished moment that makes you go “aww”. Take the opportunity to memorialise it and take it you wherever you go with a customised phone case. With all these helpful tips, it’s time to get cracking and get a head start on spring cleaning those photos and create something beautiful this season!